What's the Best Polymer Clay For Sculpting? You "Knead" To Read This! 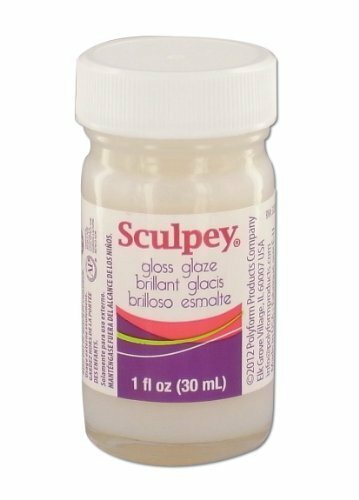 What’s The Best Polymer Clay For Sculpting? You “Knead” To Read This! 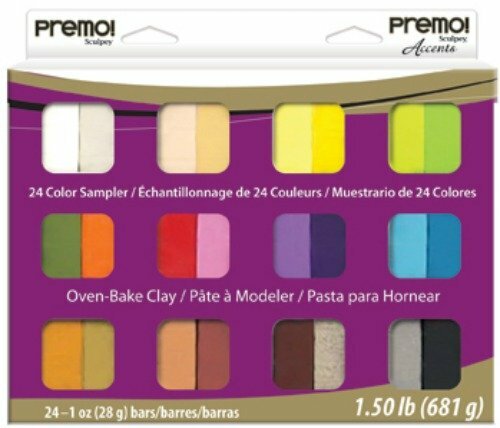 What’s The Best Polymer Clay For Sculpting? 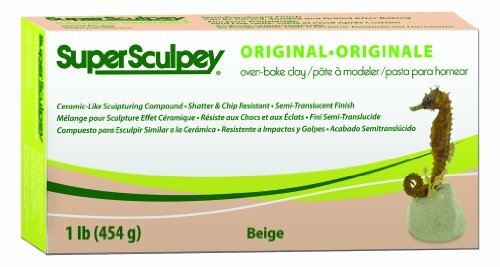 Why is Sculpey the best oven baked clay brand? Any caveats to keep in mind? Are You Ready To Get Your Sculpting On? Who makes the very best polymer clay for sculpting? 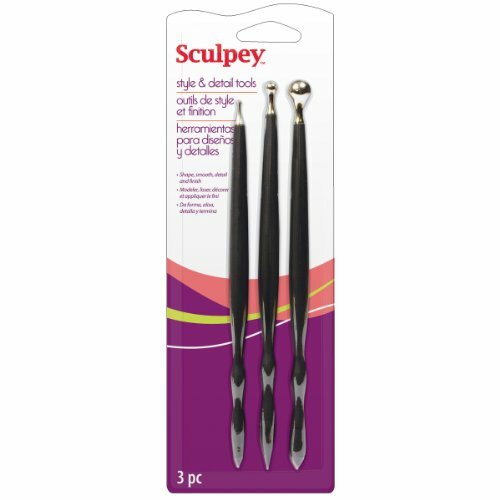 If you’re serious about sculpting and crafts, you know you can’t afford to cut corners. After having caught sight of this amazing material and not having to fork over thousands of dollars for a professional kiln, I have to tell you this stuff is the bomb! Yes, I have used air dry clay too in the past but when I discovered the kind of clay that bakes up in a home oven and I could make literally anything under the sun I never looked back. I’ve had my share of poor choices too, for example, I bought a couple of 2 oz bricks of clay way back when and either I got a bad batch or something as they crumbled right out of the package. No hard feelings, just wrote that one off and kept going, as I have always enjoyed sculpture and making things. Figurines, wall art, miniatures, you name it. 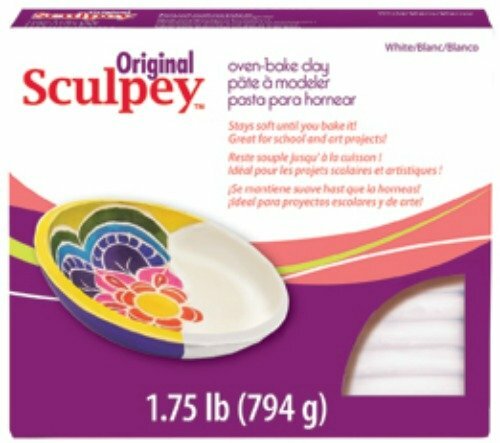 Ultimately, Sculpey is the best oven bake clay brand I’ve ever used and I have been using it faithfully since Clinton was in office so that’s quite awhile. I’ve been making stuff hand over fist; just ask some of my relatives who have received Sculpey-constructed gifts made by yours truly! 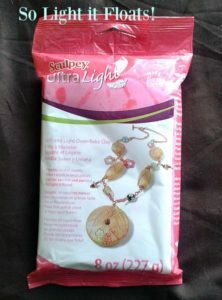 It is also drillable; when I was making projects that I wanted to hang up, I did make sure to pre-insert a hole using a pushpin or leave a gem clip inserted into the back. At the recommended temp this is certainly an acceptable practice. You can use the sculpting tools of your choice, but there is no need to moisten it. It’s already pliable and you only need to knead it for a few minutes out of the box to get it “primed” well. Your fingers and imagination will do most of the work. These are the main reasons I love it, and you most likely will too! It comes out of the package soft and pliable. Bakes to a hard finish in about 20 minutes in your home conventional oven. You can paint it or glaze it when you have finished baking. This clay is made from polyvinyl chloride which gives it a certain tensile strength and ability to withstand heat It is called polymer clay for this reason as that’s the bread and butter of it. These attributes make it perfect for home use and why it bakes up nice and firm – so it does not need to be “fired”. When “in the raw”,it has a slight stiffness to it; this is normal. 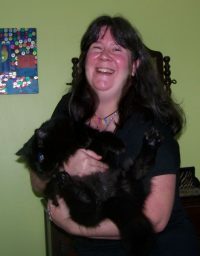 I just start kneading it a little and within 5 minutes I am on Easy Street – just grab a few tools and go to town! You can also use preformed molds or wire armatures in the making of your projects easily; since the recommended oven temp is below 300 degrees there is no concern for possible hazards. You can store it at room temp if you have any unused product; something like a Ziplock bag will do fine for this. You can return to the unused portion and just start kneading it and it will soften up fairly easily. 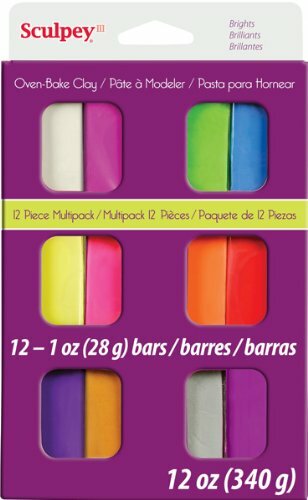 Sculpey is available in 1 pound “bricks” and larger and also small 2 oz package sizes.The 2 oz sizes carry a wide gamut of multiple colors but there is also the Premo variety which consists of pearlescent variations and metallic sheen colors too! The larger “bricks” come in more basic colors. My favorite of all is Super Sculpey, which is a dream to work with and pliable yet strong. it is like a terra cotta color out of the box, but dries to a fleshy translucent color making it the best type of polymer clay for figurine work. 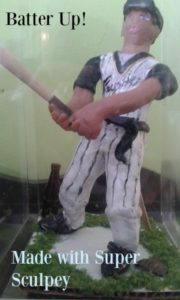 The baseball player figurine I made in the left image was made using this one; as you can see I only had to paint in his uniform. 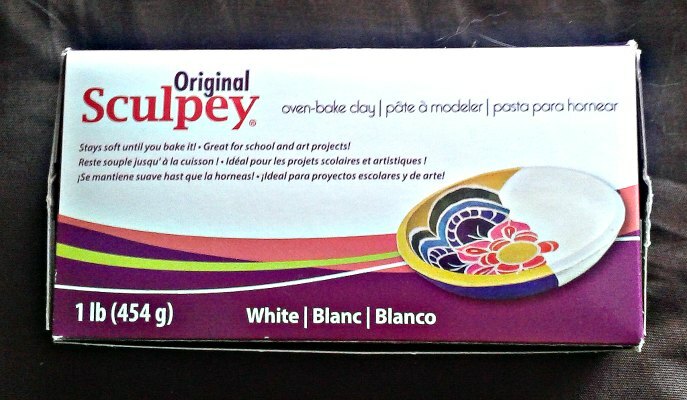 “Original” Sculpey is plain white in color and in my experience is a little stiffer than the Super. Another great offshoot is Ultra Light. a variation of their original clay product that, as its name insinuates, is a real lightweight. Let me tell ya, this is pure bliss, it’s almost like molding a marshmallow! It must be popular, too, as it’s not always findable at my usual venues. 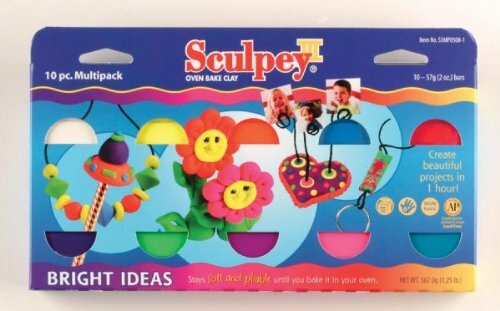 It is perfect for things like wall hangings, figurines, or building over armatures – generally, sculpture projects that you really don’t want much weight to. And it’s so light it floats! Good news if you’re into stuff like model boats. Its softness makes it more suitable for large-scale sculpture projects; I find it stretches a good bit; which can be a good thing depending on what you’re trying to create. However when I’m working on something requiring fine detail I usually prefer the first two types; being more firmer bodied. When baking, how much to err on the side of more or less depends solely on your unbaked item’s square inch volume. One-fourth to one half inch of thickness of an object is what the 275 degree /20 minutes standard is set for. I tend to “hollow out” many of my projects for this reason; it makes the process consistent. 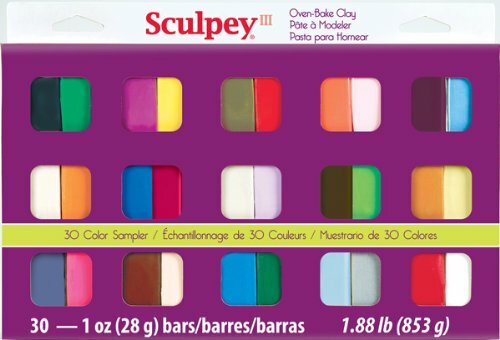 Be sure and use your Sculpey bricks within a reasonable time frame from purchase. Recently I made this ring keeper and I used the same package you see in the picture below, which was new and never been used but I had it stored away for about a year. Although it still worked great, I had to work it a little more than usual as there was some slight crumbling out of the box. Try to avoid overbaking; a margin of error by two minutes may not hurt (at the worst my projects might have gotten a few little brown spots) but just use your common sense here. I turn the oven off and leave my finished projects alone, sometimes overnight. They are very hot to the touch so it’s usually the next day I get to painting them. Tip: If you lightly sand your finished (and cooled) sculptures they will take paint better. Also you may already know this but I’ll state it clearly: please do NOT attempt to microwave this or any other brand of polymer clay! Well, that’s my story on the best polymer clay for sculpting and why it is an indispensable part of my creative repertoire! 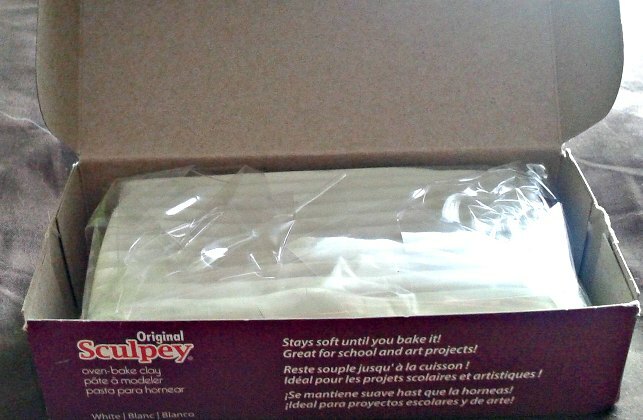 So if you’re looking for a quality clay product that doesn’t dry out easily, bakes firm conveniently in your home oven and has long-term staying power, look no further! The sky is the limit (or perhaps, the confines of your oven’s dimensions) when it comes to making jewelry, standalone figurines, pinch pots, and so much more! Want to see a few closeups of some of my favorite polymer clay projects?